If you watched CBC’s The National last night you might have caught my 15 seconds of fame as I was interviewed for a piece about perfume and perfume allergies. Unfortunately due to a miscommunication on the specific topic and my own failure to research the correct issue, very little of what I said in the interview was used, and what did get used was out of context. When the producer originally contacted me, I was told the piece was about a new law in the European Union that would force perfume companies to list the ingredients on the labels. In fact, the piece was about a move by the EU to ban certain (natural) ingredients that have been in perfume for decades and are thought to be the cause of an increased number of allergic reactions to perfume products. So when Aaron Saltzman asked me if I though the ban was a good idea, and I near-shouted “Absolutely!”, I was wrong. Don’t misunderstand – I would ban all commercial perfumes everywhere if I had the power to do so. They are unnecessary in the grand scheme of life. Perfume companies play into our insecurities and manipulate us into buying things we do not need to feel better about ourselves (you are, in fact, LESS beautiful when wearing perfume, at least to those of us with sensitive noses). They make people ill – more and more so – as this potential ban clearly demonstrates. However, my allergic reactions, as far as I can tell, are all based on inhalants. That is, from breathing in the product. Also, as far as I can tell, my allergic reactions are to synthetic ingredients in these products (I’m affected by perfume and scented laundry detergent equally, and ain’t nobody tending a field of lavender in Provence to make fabric softener); I am able to use products with “natural” fragrances or essential oils with no ill effect whatsoever. This ban would affect natural ingredients such as oak moss (a key ingredient in Chanel #5), which is more likely to cause a contact allergy, aka, a big scary rash. The thing about contact allergies is that, for the most part, they occur with prolonged exposure. Ask any person in the food service industry about contact allergies – I know of someone who developed an allergy to carrots after a year of peeling 50 pounds of the things every day. Once when I was on an internship while at chef’s school, I had to clean 20 pounds of squid every day, and by the third week of the placement, my hand were cracked and bleeding as I developed a reaction to the squid ink. So while it’s possible that a very small minority of people might have a skin allergy to a perfume after the first use, it’s more likely that someone would have to use a lot of it to have a problem. Which is why previous generations never really seemed to have a lot of perfume sensitivities. Perfume was expensive and precious – few people wore it every day and when it was worn, for special occasions, it was applied sparingly. People in previous generations also used fewer products overall, and used them with less frequency, and those products were more natural than the chemical soups we apply to ourselves today. First, most people wear so many different products that even if an allergen was isolated, unless the individual was tested for that allergen, there would be no way of knowing if it was that specific ingredient causing the reaction, or if the allergy was the result of two ingredients (possibly from different products) having a reaction to each other. Keep in mind that testing of cosmetic ingredients is usually done by the ingredient manufacturers, not the product manufacturers (in part to get around having to admit to animal testing). Seldom do cosmetic companies test to see if ingredients in a specific product might react to each other, and testing against products made by other manufacturers is never, ever done. Third, I think we really need to look more closely at the synthetic ingredients used in cosmetics, particularly over the long term. It wasn’t until the 70s and 80s that cheap synthetic versions of perfume became available, and around the same time, we started using many more products on a daily basis, most of which are, at least partially, synthetic in origin. Our parents and grandparents never used all these cosmetics and so we have no documentation as to the long-term effects of these products on our health. In an age when almost all of us have some level of PCBs and mercury in our bodies, what else might we be absorbing from the products we use every day? I have an obvious bias in wanting to see perfume banned from pretty much everywhere. Within about 45 seconds of coming into contact with a (synthetic) perfume-wearer, I experience a piercing migraine. The pain is so blinding that I have, on occasion, not been able to speak, and my husband thought that I was having a stroke. But I really don’t agree with the proposed EU ban. In fact, I’d much prefer a ban on synthetic ingredients; return perfumes the rare and expensive things they once were . Get rid of the cheaper versions, the eau de toilette, or eau de cologne, definitely ban anything in a spray format, and encourage people to wear less product overall. I think that would go a long way to cutting down on allergic reactions and to promoting the health of everyone. The perfume companies won’t go for that, of course, but if the ban passes, they’re kind of screwed anyway, so it might serve them well to be less greedy and instead stand behind a natural and artisanal product instead of selling a whole lot of inferior versions of their product to anyone with money to waste. As with any scientific study, it is important to ask – who stands to gain from this? Government bodies seldom come up with things like bans, especially bans that would affect billion-dollar industries that are part of a region’s culture and history, without someone lobbying for it in the first place. The EU, while occasionally very forward-thinking when it comes to regulations that protect its citizens, can also be notoriously corrupt. Who stands to gain from that billion-dollar industry having to reformulate hundred-year-old perfume recipes to include synthetic ingredients? It may make me a bigger conspiracy theorist than Richard Belzer, but everyone wave at those nice men from the chemical companies with the dollar signs over their eyes, won’t you? If not for the fact that it might kill me, I’d love to do a scent test, comparing various qualities of the same brand of perfume products to see if the real perfume affected me in the same way that the cheaper, more chemical-based versions do. I’m betting that the pure stuff, you know the tiny bottle that runs $400 an ounce, wouldn’t bother me at all. But I’m not brave enough – or stupid enough – to do that to myself. A list of common perfume ingredients. Info about synthetic fragrances and ingredients. Details of the proposed EU ban. From a person like myself who is practically immobilized by fragrance coming not only from perfume but other people’s hair gel, shampoo, deodorant, body spray, powder, laundry scented clothes and the very strong fabric softeners, not to mention when people start lighting scented candles, air plugs that let off “air fresh scents”, room spray, cleaning products that smell like every fruit created and the the ones that are just letting the chemical smell come through. I say it is time to get back to the basics of soap and water and environmentally friendly cleaning products. People always ask me what I use on my hair as it is thick and shiny. Olive oil soap is it. That’s it on my face and hair. “Fragrance Free” zones are something that we need now and in the future for the children in school, the workers at work, the people attending concerts, sitting in Church time, even sitting at a sporting event outside can cause many people to move if bombarded with fragrance laden spectators beside them. Yes, to “Frangrance Free” zones. p.s. Most medical offices and hospital are now fragrance free zones and I can remember years ago when I talked about such a need I was laughed at and told that i would never happen. Well, people were laughed at when society starting talking about no smoking in restaurants and bars and now look, there are even no smoking apartment complexes being build. 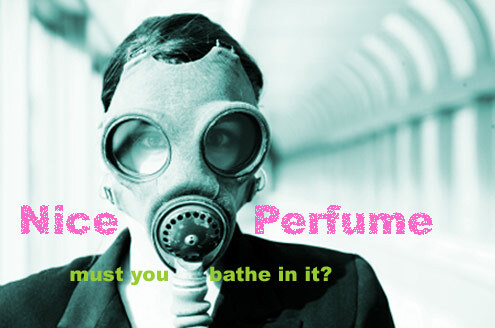 Again, I say the time has come to rid our air of these chemical pollutants and irritants called fragrances.